Magma’s Review of Beyond the Reflection’s Edge. After sixteen-year-old Nathan Shepherd’s parents are murdered during a corporate investigation, he teams up with a friend to solve the case, discovering mirrors that reflect events from the past and future, a camera that photographs people who aren’t there, and a violin that echoes unseen voices. This is the first book of a contemporary adventure fantasy series for young adults. Description: Sixteen-year-old Nathan Shepherd has a great life traveling where the careers of his father, an investigator, and mother, a renowned violinist, take him … until his parents are found murdered. Left with only a mirror and notes from his father’s last case, Nathan goes into hiding at the remote country home of Tony, his father’s college buddy, and Tony’s teenage daughter, Kelly. The mysterious mirror must be a clue to what happened to his parents, and when images appear in it—people and things that don’t exist—Nathan and Kelly painstakingly gather evidence. But the killers want the mirror too, and danger threatens the teens at every turn. As it becomes evident that Nathan’s father had stumbled upon dark forces at work in the world, several questions arise. Could it be that the mirror is a portal to a parallel world? Could this technology be used for evil purposes? And could his parents still be alive, trapped in another dimension? Nathan and Kelly struggle to solve the mystery before they too become victims. This chilling, hair-raising adventure is jam-packed with action in a fantastical world where nothing is as it seems, and even mirrors tell lies. A VERY intriguing scifi mystery thriller by Mr. Davis. It is definately for 13+ but the teens that read it should definately LOVE IT! Mirrors, spies, interdimensional intrigue…..what more could you ask for? You guys should try to get this book into your library, and make sure you don’t have a big test to study for…..cause once you start reading it you won’t wanna stop! I had the great privilege of pre-reading this book. I don’t want to spoil the surprise, so I will only say that after being enthralled by the world Bryan Davis created in Dragons in Our Midst and expanded upon in Oracles of Fire, I eagerly anticipated his new series, Echoes from the Edge. The characters, like those in his first two series, are realistic, relatable teens that readers of all ages can identify with. 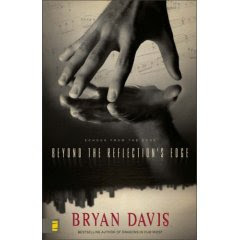 I see echoes of myself in Daryl, who constently alludes to and quotes from such favorite fantasies as Lord of the Rings and Narnia, as well as The Wizard of Oz.My good intentions to read only a chapter of Beyond the Reflection’s Edge daily evaporated. I read the whole book in less than four hours. The first chapter contained more emotion and action than some books ever reach. From there, the story builds in depth and action to an extraordinary conclusion. Unlike some books, Beyond the Reflection’s Edge yields more excitement with each re-reading. I can’t wait for the next installment!I highly recommend this books for fans of Narnia, Lord of the Rings, Binding of the Blade, and any other faith-based fantasy. This book has an extremely original plot line and characters.